5) limiting global warming to 2°C will require half of all global energy to be produced by either renewables in year 2060 or by combustion of fossil fuel coupled to efficient carbon capture and sequestration ... we repeat, half of all global energy. This will require a massive transformation in how energy is produced, both in the developed and developing world. The time to start is now! Section 1.2.3 of the book, entitled Human Fingerprints, includes extensive discussion and illustration of the quantitative consistency between various aspects of observed and expected changes in atmospheric temperature and composition, which allow us to confidently conclude human activity is responsible for the rise in temperature over the past 165 years shown above. EM-GC: The book uses analysis and projections of global mean surface temperature conducted using a computational tool called the Empirical Model of Global Climate (EM-GC). Our model is described in this journal article Canty et al., ACP, 2013. Simply put, as shown below, we calculate the influence on global mean surface temperature of human activity, major volcanoes, variations in solar irradiance, as well as exchange of heat between the ocean and atmosphere due to a phenomena known as the El Niño Southern Oscillation (ENSO), changes in the strength of the Atlantic Meridional Overturning Circulation (AMOC), the Pacific Decadal Oscillation (PDO), and the Indian Ocean Dipole (IOD). 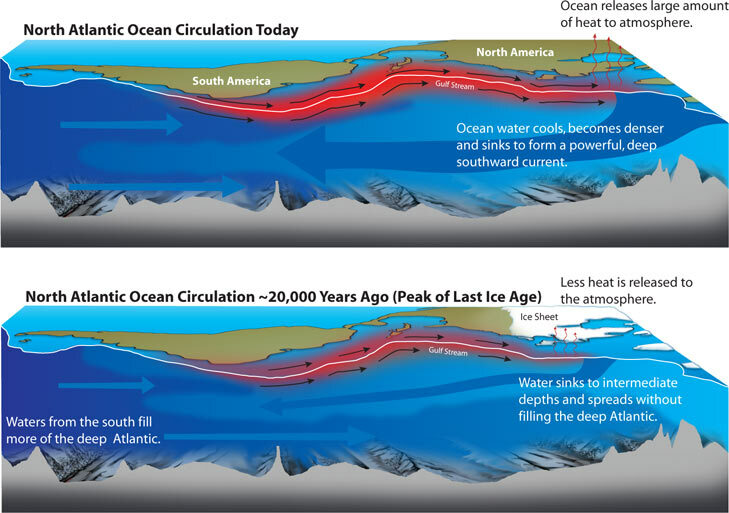 The long-term transport of heat from the atmosphere to the ocean is explicitly represented based on simulation of the observed rise in ocean heat content (OHC). We then project future warming based on values of climate feedback (parameter λ) and eddy heat diffusion coefficient (parameter κ) inferred from the actual temperature record, assuming neutral conditions for future ENSO, Volcanoes, Solar, AMOC, etc and continuation of the rise in OHC. As explained in Chapter 2, these projections consider a wide range of uncertainties regarding radiative forcing of climate due to GHGs and a class of human pollution called aerosols, as well as various data records for ocean heat content. The scientific message of the figure is that human activity has caused the actual climate system to warm by about 0.11°C per decade from 1979 to 2010, whereas climate models project a warming of about 0.22°C per decade should have occurred. Section 2.3 of the book compares and contrasts these estimates of AAWR to other values in the scientific literature. The CMIP5 models used by IPCC (2013) suggest that RCP 2.6, which poses stricter controls on the emission of GHGs, is the 2°C pathway. In other words, our analysis suggests RCP 4.5 is the 2°C pathway ! Again, simulations conducted using our Empirical Model of Global Climate indicate that if the future emissions of GHGs can be reduced such that atmospheric abundances follow the RCP 4.5 trajectory, there is a high probability the goal of the Paris Climate Agreement will be achieved. In other words, carbon emissions must be reduced such that the future atmospheric abundance of CO2 remains below about 540 ppm (parts per million) and the future growth of atmospheric CH4 must be halted. In Section 4.4.2 of the book, we quantify how the future growth of atmospheric CH4 impacts the probability of achieving the goal of the Paris Climate Agreement, should atmospheric CO2 follow RCP 4.5 and should CH4 continue to rise. The scientific message of this figure is that, if all of the Paris INDCs are followed and if the world continues to reduce GHG emissions out to year 2060 in a manner that builds on the reductions needed to achieve the Paris INDCs, then global emissions of GHGs could be quite similar to those used to drive RCP 4.5. Message 5: limiting global warming to 2°C will require half of all global energy to be produced by either renewables in year 2060 or by combustion of fossil fuel coupled to efficient carbon capture and sequestration. The message of this figure is that to keep GHG emissions below that of RCP 4.5 in year 2060, and at the same time meet a projection of future global energy needs, the world must produce a considerable portion of global energy using sources that do not emit GHGs, with this portion rising to about 50% by year 2060. To achieve the steeper GHG emission reductions of RCP 2.6, the key metric is about 90% of total global energy without releasing GHGs by year 2060.